Vero Beach, FL When GHO Homes Corp. President Bill Handler is asked about the progress at Fieldstone Ranch in Vero Beach, he’s delighted that despite what has been a challenging marketplace, Fieldstone Ranch has become a very successful community. A community of 129 home sites in a peaceful country setting that’s close to everything, Fieldstone Ranch offers homebuyers an impressive lineup of great home designs that blend beautifully with the surrounding rural countryside. Fieldstone Ranch features 11 creative and open floor plan designs priced from the high $100's to $300k. All homes offer gourmet kitchens showcasing G.E.® appliances, luxury bathrooms loaded with thoughtful details, designer finishes and materials, and many other amenities. Superior quality concrete block construction with steel reinforcement, underground utilities connections, and many energy efficient and safety features are also standard in all Fieldstone Ranch homes. For homebuyers looking to move in now, there is a limited number of “Quick Delivery Homes” also available at Fieldstone Ranch right now. The oversized home sites (80’ x 150’) offer large lawn areas with setbacks, allowing ample room for expanded outdoor living areas, a swimming pool, gardens and privacy. Many of the spacious lots are lakefront properties, lending a serene setting; and the wide sidewalks and master lake-fed irrigation system are just a few of the advantages residents enjoy when they build inside Fieldstone Ranch. To top it off, Vero Beach’s numerous services, amenities and recreation are all conveniently nearby. 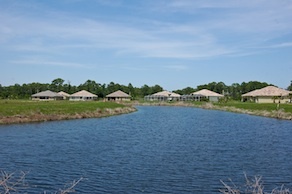 Fieldstone Ranch is located at 6125 77th Street in Vero Beach. From I-95, take Vero Beach exit 147 to Rt. 60 East. Turn left on 66th Avenue for 6 miles, then right on 77th Street. The entrance to Fieldstone Ranch is on the right. For more information, call (772) 257-1100, ext. 1 visit ghohomes.com, or email sales@ghohomes.com.